A drawing for the magazine Paris Match. It was found on the magazine’s website, I am not sure the picture was printed in the actual magazine. In Casemate 11 (february 2018), you can read a long interview with Cosey. 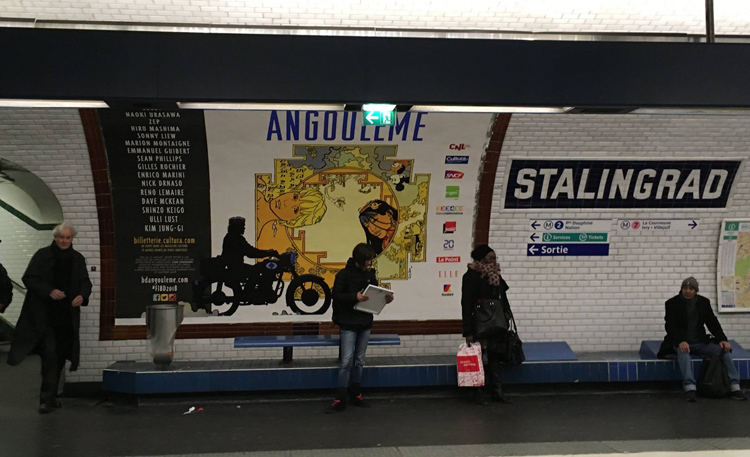 The cover shows how bad graphic design can destroy the great Angoulême poster – it hurts to the eyes. You can order the magazine via this website. Another special edition: ‘À la recherche de Peter Pan’, published by Niffle. It is the complete story in black and white, on a large format (27 x 34 cm). 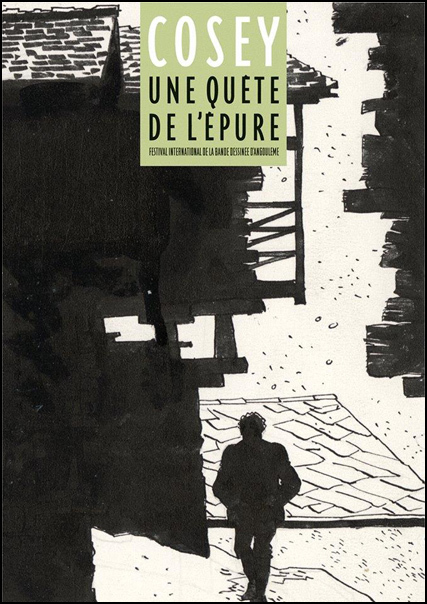 Originally announced for 26 january (just in time for the FIBD in Angoulême), it has been delayed to 16 february. 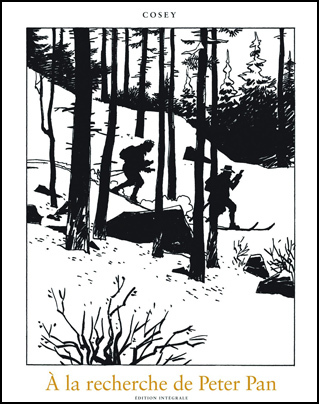 This is the second black and white edition of ‘À la recherche de Peter Pan’, after the one published by Raspoutine. This is a more affordable edition, but it lacks the luxurious extras of that album, of course. 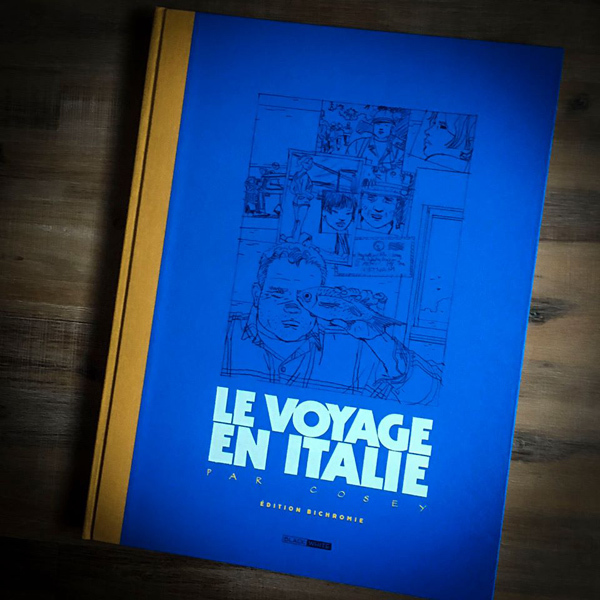 In Angoulême, I discovered a special edition of ‘Le Voyage en Italie’. ‘Les Éditions Black and White’ had published a luxurious anniversary edition of the album, celebrating its 30th birthday. This publisher, based in Strassbourg, is a specialist in special, luxurious editions, and they have done a great job. It is an album on a large format (30 x 40 cm), with the story printed in bichromie (two colours), blue and orange. It is not just a transposition of the original album in these two colours, but an entirely reworked and revised edition. It took a full nine months of hard work, supervised by Cosey. The result is a fascinating new look. I especially like the night scenes. The album is signed, numbered (there are only 225 copies) and it includes a silk screen print. You can find the publisher on Facebook. 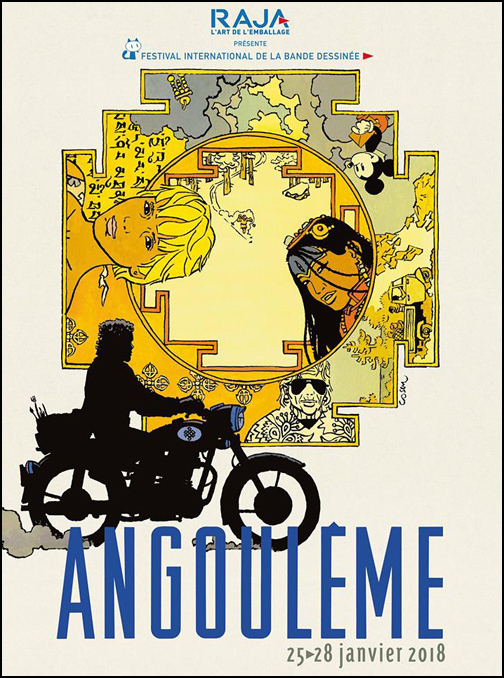 Just before the Festival in Angoulême, Le Lombard published the last volume of the Jonathan Intégrale, containing the last two Jonathan stories (‘Atsuko’ and ‘Celle qui fut’). This time , the dossier is a long and interesting interview with Cosey, by Isabelle Dillmann, with the title: ‘Cosey, ou l’idéogramme intérieur’. Illustrated with a lot of photos and drawings, of course. Last Saturday my wife and I visited the FIBD in Angoulême. I had the opportunity to meet Bernard Cosey himself, for the first time. He had a day packed with presidential obligations, but he took some time before his duties began. We walked from his hotel to his exposition, talking about the Festival, his books, my site, etcetera etcetera. A very nice meeting! During my visit to the exposition, I met another Bernard I had also never met before, Bernard Matthey-Doret. He is probably the greatest collectionneur of Cosey works, and certainly the greatest expert when it comes to special editions and all kinds of publications. 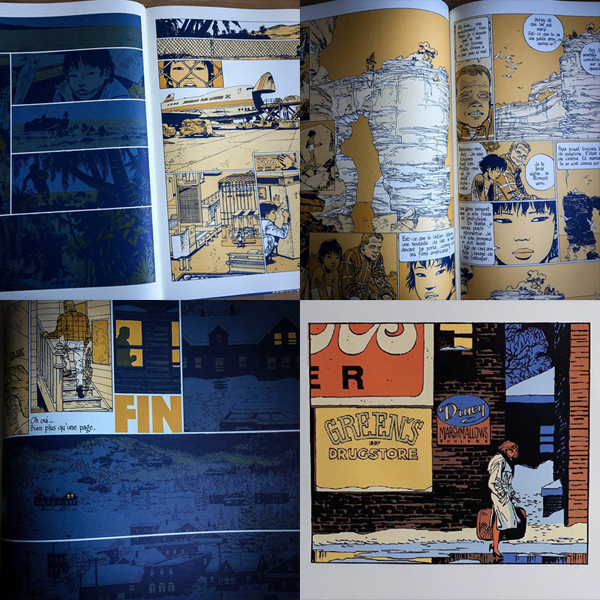 Since I started my site in 2002, there has been regular mail traffic between us: he sends me scans of new publications and I send him questions regarding images I find on the internet (in all cases he had the answer). In the afternoon, we met again, talking about Cosey’s work until a restaurant employee asked us to leave the place. 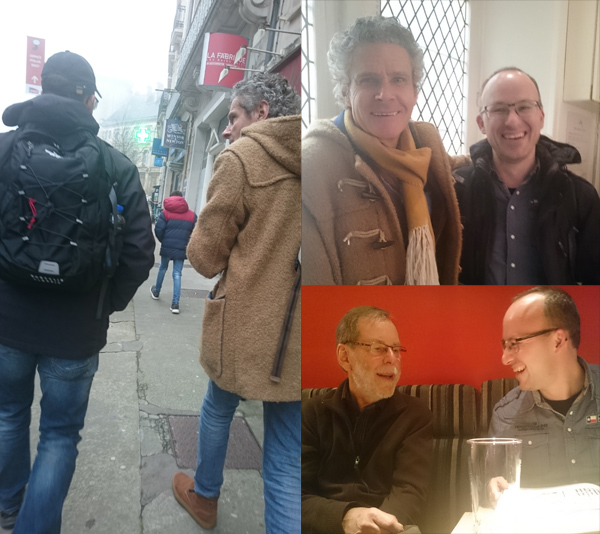 Two special meetings, beautiful expositions and a few bags with nice acquisitions to my collection: it was a very good day in Angoulême. Another palm was added to Cosey’s list of prizes and awards. In Angoulême, the 25th january, France’s Minister of Culture, Françoise Nyssen, pronounced Cosey ‘Chevalier des Arts et des Lettres’ (‘Knight of the Arts and Letters’). 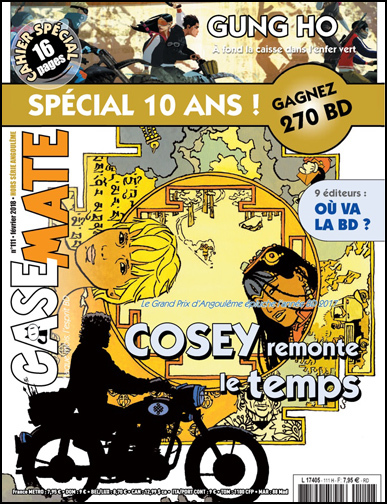 The title had been granted to Cosey on 21 april 2017 already, but the actual medal was given to him in Angoulême this year. 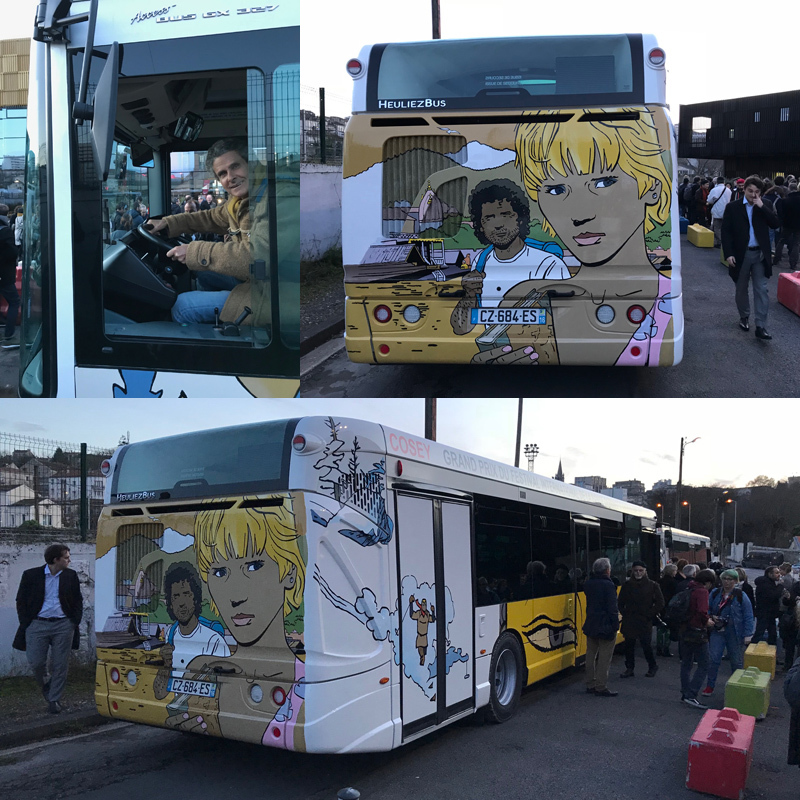 Cosey drove his own bus to the Festival in Angoulême. 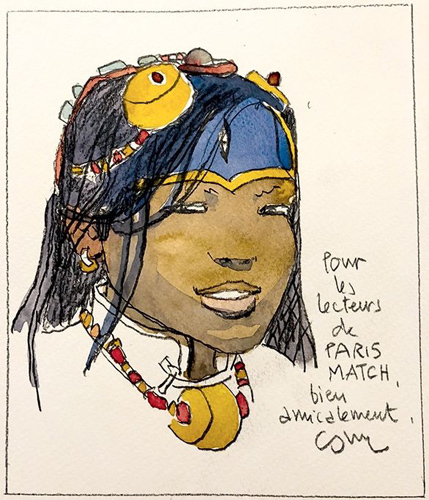 1975 – Jonathan 1: Souviens-toi, Jonathan… The earring of Saïcha. The first Jonathan, an obvious choice to include in the poster. 1978 – Jonathan 5: L’espace bleu entre les nuages Clouds and blue sky refer to the painting that gives its name to the album. In many interviews, Cosey has said this is one of his favourite Jonathan albums. 1980 – Jonathan 7: Kate A break-through album, winning the prize for ‘Best album’ in Angoulême (in 1982). 1984 – À la recherche de Peter Pan His first one-shot album with its iconic cover. 1988 – Le Voyage en Italie His second one-shot album, starting the famous Aire Libre collection of Dupuis. The album with an ending that hurts. 1997 – Jonathan 12: Celui qui mène les fleuves à la mer After a break of eleven years, Cosey continues his Jonathan series. 2005 – Le Bouddha d’Azur Cosey’s farewell to Tibet. 2016 – Mickey: Une mystérieuse mélodie A childhood dream comes true when Cosey makes a Mickey Mouse album. 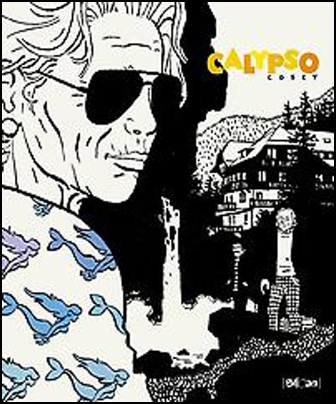 2017 – Calypso Cosey’s first black-and-white album. And finally – Jonathan or Cosey, the eternal question. From the very start of the Jonathan series there has been confusion: is Jonathan Cosey? Cosey’s answer: Jonathan is an imporved version of himself, the most notable difference is that Jonathan ages much more slowly than his creator. Two days to go and the ‘Festival International de la Bande Dessinée’ will start. As you know, Cosey is the honorary president this year. The Festival invites us all to put some colours to Cosey’s drawings of Bouddhist symbols and statues. You can download it on the website of the Festival. Another thing is the catalogue of the exposition ‘Une quête de l’épure’ (I would translate it as ‘A quest for purity’, although I understood that ‘épure’ doesn’t exist as a french word in this sense). The catalogue can be ordered in the Festival shop. Something strange seems to be going on wth the book cover: a few weeks ago I showed the cover with a green rectangle behind the text, yesterday this rectangle had the warm yellow colour we know so well from Cosey, today I found that it is orange. It seems the covers are following colours of the rainbow – I am curious to know if the actual book will be available in different colours too. Cosey in the Paris métro. A picture taken by Diane Rayer. 17 january 2018, a dutch translation will be published by Blloan, an imprint of Ballon Media. 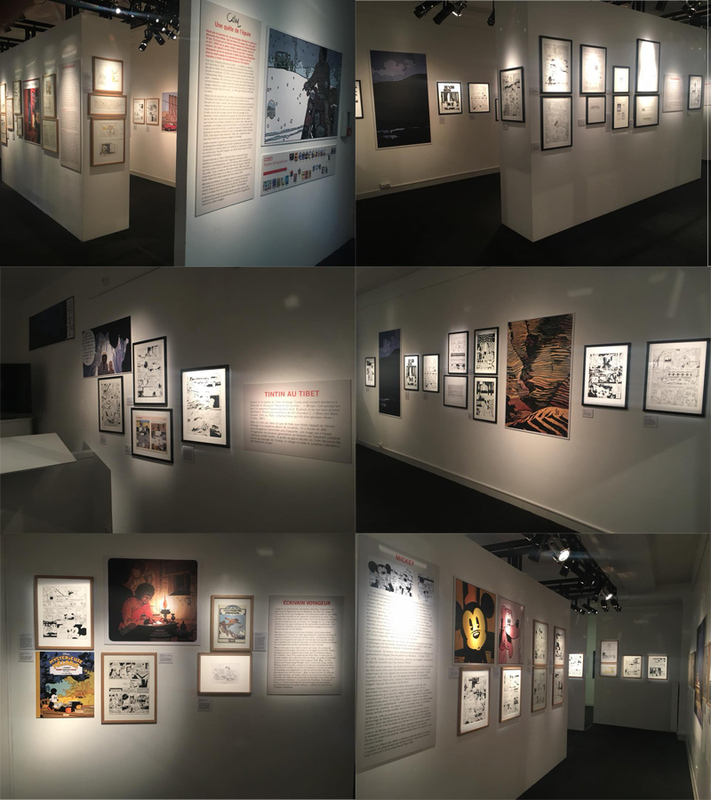 Every winner of the Grand Prix d’Angoulême is honoured with an exposition in Angoulême the following year. 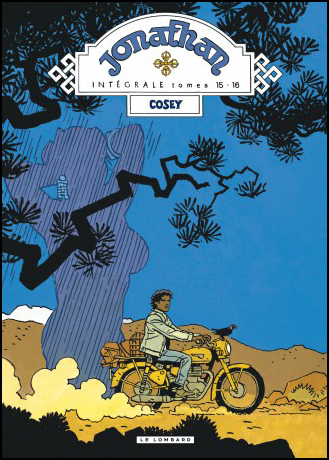 The title of the Cosey-expo in January 2018 will be ‘Une Quête de’Épure’ (‘ A Quest for Purity’). This is the cover of the catalogue going with the exposition. This is the poster for the Festival de la BD in Angoulême 2018: a ‘thanka’-ish composition of highlights from Cosey’s career. Cosey plays with the blurred distinction between himself and his famous character Jonathan, by drawing himself/Jonathan in silhouet, and putting some drawing tools in his/Jonathan’s bag.